On June 7th, 2012 a remarkable thing happened to Heather and I. We drove to Guadalajara! I attribute this to not parking the Jeep near any trees or other things that could fall down on it. We made sure to visit the mechanic to have the oil changed, the brakes checked and the bolts tightened so it was running well. It all worked. At 11:30 am on Thursday June 7th, we backed out the driveway of Casa Madera Bed and Breakfast and hit the road. It was exciting. Our first road trip in quite a while. We were giddy with anticipation. Or was it hunger. It had been 4 hours since breakfast. So we made it as far as Bucerias (12 minutes) before we stopped for lunch. But hey, we were on the road! A quick lunch and we were off. It was a nice day for a drive, sunny but not too hot. The traffic was relatively light which was really nice. It was a pleasant 4 hour drive to the big city. We had booked ourselves a room in the Suites Bernini as it appeared it was close to the fabric store area. We had never been to the hotel before and really had no idea where it was but thankfully the gps was able to pinpoint it and made it relatively easy to get to which at 4:30 in the afternoon is a good thing. After checking in and putting the Jeep in the smallest parking lot known to civilization we took the elevator up to our room on the 16th floor. Only the penthouse was above us. The view should be spectacular! We were right, the view was spectacular. The interesting thing about this view was that the entire wall was glass, floor to ceiling. The top half, opened. Totally opened. We could open the window up 4 feet. It was just a little disconcerting. We got used to it but neither one of us ever really got close to the glass. The area had many watering holes and restaurants. It was tough to make a choice of where to eat but we did and the food was great. So many places within 4 blocks and so little time we will definitely return. Friday morning we were out and on foot looking for the fabric stores that Heather wanted to visit. We hit the area right, there was a street of fabric stores, bridal shops and general formal party wear just a couple of blocks from the hotel. It was a beautiful street with a pedestrian walkway down the middle of the road with benches, fountains, shade, plug-ins and wi-fi. It was a great way to spend the morning before it really got hot. Once it did we headed out to the Galeria’s mall. I know what you are saying, a mall is a mall. And you would be right but this mall had a Krispy Kreme kiosk, sigh…oh and a Best Buy. All it really needed was a Golf Town. On Saturday we were going to move hotels over to Tonala as we wanted to do the market on Sunday. So we checked out of the hotel after breakfast and headed out. 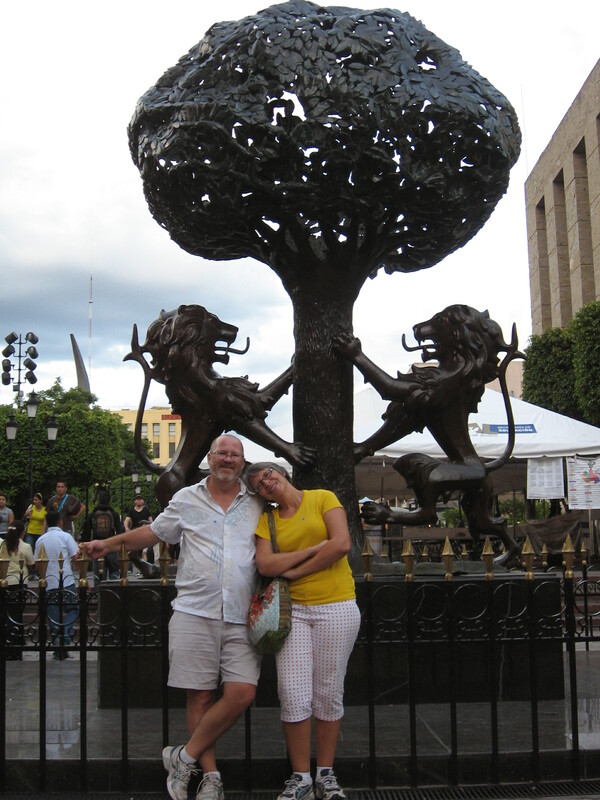 Our plan was to spend a few hours in Tlaquepaque to check it out but do all of our buying in Tonala. Tlaquepaque is another must visit in Guadalajara. Beautiful galleries, totally different handicrafts than we have seen here before and a nice traffic free pedestrian only mall. It was fun. It was there that we found the Tapatio Tourist bus. For 110 pesos you could ride the double-decker bus to downtown Guadalajara where you could take the Guadalajara tour, or change to the Zapopan bus and take that tour. 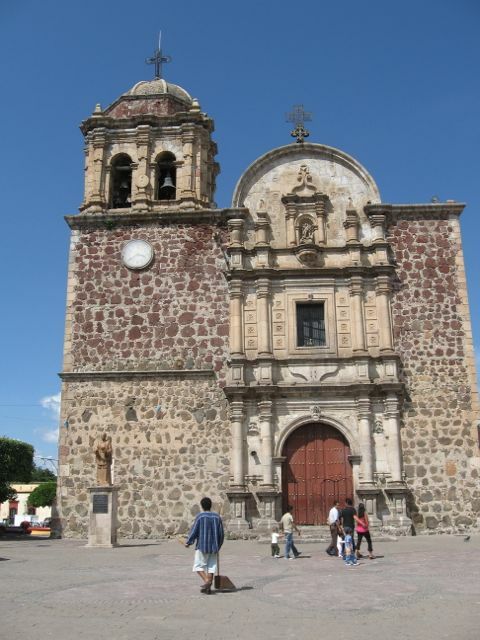 From Tlaquepaque you could catch a tour bus to Tonala. We decided to take the Guadalajara tour. It was cool. The roof of the bus is open air so you can take it in all the sights and sounds. It also has stops along the way where you could get off, see this attraction and catch another bus an hour or two later. Great idea. 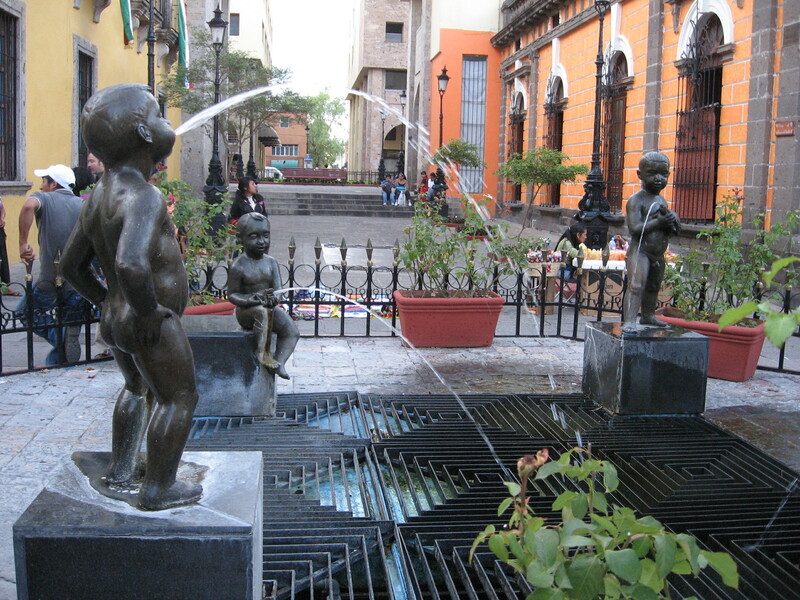 We really enjoyed the Guadalajara tour. When you are not driving you can take it all in. It allowed us to see where things are so in future visits we will have more of an idea where we are going. When the tour is over they park downtown by the government buildings and main cathedral. When getting off of the bus they told us that the bus back to Tlaquepaque leaves at 4:30 and it is bus number 4. This gave us about an hour to kill so we wandered around, toured a corn exhibit in the main City square, bought a cold lime and salt drink and then just headed for shade to wait for bus number 4. At 4:15 a bus pulled in, number 2. At 4:22 I wandered over to just double-check where it was going and just before I got to it the bus pulled away. There are 6 traffic lanes in this traffic circle, there are at least 6 of these in town. Fun to drive in! Really! So we waited for bus number 4. At 4:40 we finally asked the tour people where the Tlaquepaque bus was and they told us it left 20 minutes ago. Well this was a problem. First off, it left early and was not the right number. Our car and our luggage was sitting on a side street in Tlaquepaque. There were no more buses. They did eventually see the problem and started to make phone calls. Finally they said a bus would be by at about 6:30. This was just under 2 hours away. We had yet to get a hotel, this was too long to wait. So we eventually took a taxi back to Tlaquepaque. Will we take a Tapatio tour bus again? You bet. It was great. Yes there was that little glitch but it was our fault as much as theirs. And where else can you spend a day travelling around a city getting on and off a special tourist bus for less than 10 bucks. The taxi driver knew where we needed to go and dropped us close to our car, into it we got and started searching for the hotel. We knew where we wanted to stay it was just finding our way there. That is always the main challenge. Surprisingly it did not take that long to find our Hotel, the Hacienda del Sol. Once registered and luggage put away we headed out in search of food and drink. Found a great restaurant 4 blocks away with super cold beer and great beef. It was a lovely meal. Sunday brought the market. Always a lot of fun. People everywhere, stalls everywhere. You can buy everything under the sun there. And we did. More artwork, soap, lamps, mugs and so many other things it just too hard to list them all. Just a tiny, tiny bit of the Tonala market. On Sunday night we went for a walk. It was a beautiful evening and while walking during the day we stumbled upon the town square so we wandered down to check that out and see if there was anything good to eat. Sunday night is the night to go to the town square. It is teeming with life. Food stalls, music stalls, bands playing music, places to get drinks. It is something else. On this day we found something really special, a corn dog. Hot out of the oil. Heather thought she had died and gone to heaven. There are just some things you don’t regularly see on the street here for food and corn dogs are one of them. Alas he only had one left so I was forced to have a deep-fried taco instead. Oh, poor me. Monday morning it was time to head for home. So after a quick stop at Krispy Kreme to pick up a dozen glazed for the road (they really are the best donuts in the world) we were on our way. Monday morning rush hour in Guadalajara. All this for Krispy Kremes….. Author Kevin WoodPosted on July 21, 2012 Categories Starting new lifeTags Bed and Breakfast, Casa Madera Bed & Breakfast, Guadalajara, Guadalajara Jalisco, Jeep, Krispy Kreme, Mexico, Nuevo Vallarta, Puerto Vallarta, Tlaquepaque, Tonala5 Comments on The Journey to Casa Madera – Guadalajara, It took a year but we finally got there! December 31, 2011 – It is another beautiful morning in Nuevo Vallarta at Casa Madera Bed and Breakfast. The sun is coming up over the mountains, no clouds and a lovely 18 degrees. It is sooooooo boring. Everyday the same thing. No clouds, sunshine, beautiful temperatures and an afternoon breeze off the bay. Do I miss that old Alberta standard, “Don’t like the weather, wait 10 minutes”, not a chance! It has been quite some time since I posted a new entry to this blog and for my regular readers I apologize but I just could not decide what to write about. A bit of writers block maybe, who knows. Either way, it is time so I thought I would review the year and see where that takes us. 2011 was our first year of operation and like most new entities it was anything but spectacular. Heather and I made a commitment to ourselves that we would grow this project organically without a big splash so we knew it will not happen overnight. It would all rely on us, success or failure. Nothing like pressure. Especially for me, an introvert, relying on my sparkling personality was not going to be easy! It was with great trepidation that I went to the airport on January 6, 2011 to pick up Doug and Linda from Leamington, Ontario. Our first guests staying longer than one night. To say Heather and I were a bit nervous was an understatement. We were terrified! What if they don’t like my cooking, or the way the pressure pump comes on for no reason. There were a multitude of things that were running through our heads and to top it off my old boss from Peace Hills Insurance and his wife, Bob and Susan were due to arrive 90 minutes after Doug and Linda. Yikes! My fears quickly dissipated as I saw Doug and Linda come through the arrivals gate. It was not hard to pick them out as Doug had broken his leg 10 days before he came down, so I pretty sure the guy in the wheelchair with the full leg cast was my guest. When they arrived at the house they could not say enough good things about it. Their comments helped relieve a lot of the pressure we were feeling. When Bob and Susan travel they always stay in bed and breakfasts’ so the nice comments from Doug and Linda aside, the litmus test was going to be the b and b pros! We could not have asked for nicer guests to cut our teeth with. Our fears were alleviated and everybody had a great time. It was a sad day for Heather and I when they all went home. Susan, Heather and I with that Vallarta specialty Pescado Zarandeado, quite simply the best fish you will ever eat! Both couples are returning to stay with us again this year so we cannot ask for any more validation than that. Heather and I have been in Mexico now for 3 full years and we learn or see something new almost every week. Some of that knowledge comes from locals and some comes from tourists who have been coming here for years. Either way, we are like sponges and take what we learn to try to give people the best time they can have with things they may never have done before. In February we were visited by Don and Charlotte from Niagara Falls, Ontario. Friends we met when we were still living in the Condo. We had a great visit with them and look forward to seeing them again this year when they arrive in Puerto Vallarta. March brought my son, Brendan, down for his 21st birthday with his buddy Ray. They were quickly followed by Heather’s Aunt, Danny. It was with the 3 of them that we ventured out into the wilderness to find a set of hot springs armed with directions that said, “take a left at the big road and keep left at the fork”. Talk about a wing and a prayer. However we got there and it was well worth the effort. 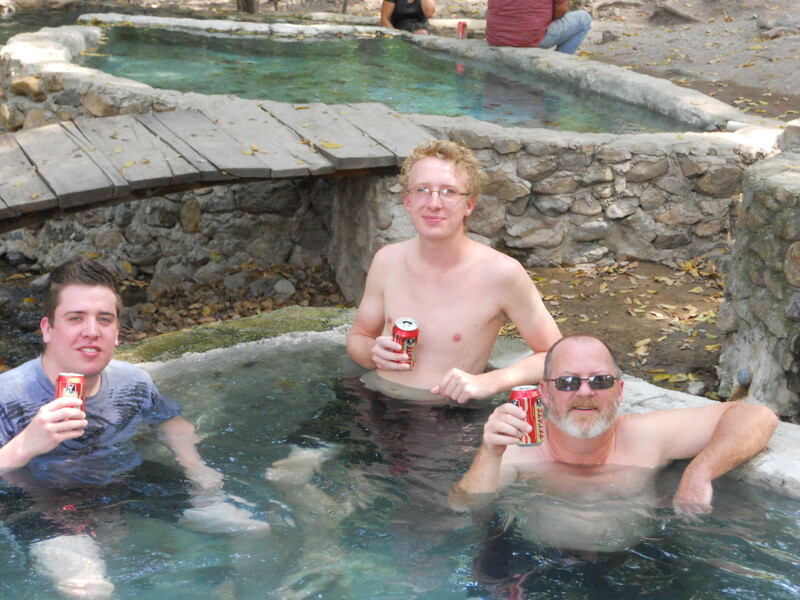 While rustic, the hot pools were spectacular and now on our list of regular places to visit. April was a busy month as Heather’s brother, Kevin and family arrived for 10 days. A great time was had by all, though I think they really enjoyed the two days that Heather and I were away in Ajijic. They really enjoyed having our dog Alexa to watch over them and keep the safe. Alexa rarely sleeps outside at night but she did while we were away. In front of the door to the kids room, nothing was getting by her there. Of course they did have to figure out how she was getting out of the yard and following them when the went to the beach. Only dog I know that weighs 60 pounds and can balance on a 5 and a half-foot high fence that is 4 inches wide while nosing her way through the barbed wire…. May was a very quiet month until the beautiful pine tree outside our yard came down on the roof of the car just as we were about to leave for Guadalajara. I covered that in the post , “Julio we told you the tree had to come down“, so I will not go over that again. June was spent trying to get a few things done outside before the rains began. Mainly redoing the roof. We had done it the year before but one of the workers working on our kitchen renovation in the winter had been trying to straighten a concrete cage by banging against the roof. Needless to say the rubber seal did not stand up to the sharp wire edges. I also took this time to try to paint the mirador. Now that was work. The mirador is basically a 2 storey structure on our roof. While a great idea just for the view, it is virtually impossible to paint. I think the only way to actually paint it properly would be with scaffolding or hanging off the structure by a rope. Something that I am just not prepared to do nor let anybody else do though I suspect I could find a lot of volunteers if the price was right! 4 kittens. It was a few days before I could actually ask Heather about these kittens. She advised that yes, we do in fact have 4 kittens but they are cute we should have no problem giving them away. 4 of them, always looking for trouble! As you can tell they are still here! On September 2nd Lorne and Heather came down to celebrate their anniversary. We had a great time while they were here but the highlight was taco night at Cessa’s. A friend of our introduced us to his stand a few months previous and it has become a regular stopping point for us on the weekends. I have eaten a lot of tacos in the last few years but there is no doubt, his are the best! Their short visit was an absolute hoot and as before we were sorry to see them go home. In October I was washing tile on the main floor prior to putting a new seal coat on it when Zorro went by with a lizard in his mouth. It turned out to be the last time I saw him as he never came home again. We don’t know what happened to him and never will I suspect but we miss him terribly and hope that maybe he just ran off on a great adventure. In November we were joined by Keith, Sherry and Jordan who spent a few days with us before moving to the Rui Palace for a wedding. Again we got to do the tourist thing, hanging out on beaches, going for tacos and then trying to find churros. We love it! December brought the Christmas season and we always have to go downtown to watch the processions to the main cathedral. The dancing, the music, the bells and street food make it such an enjoyable night. We loved being able to share it with my brother Larry this year. If you are ever thinking of coming down here or will be here between December 1st and 12th, you must take these in. Yesterday I was faced with that trepidation again. Two new guests we had never met were about to be picked up at the airport. Dave and Shelly from Yakima. As usual my fears were for no good reason and we had a lovely visit with them last night. Tonight they are cooking us dinner and we will ring in the New Year on the beach watching the fireworks from around the bay. It will be a great time. I love being a tourist in my town especially one with so much to offer. To those that helped make this year special we thank you and for everybody…. Author Kevin WoodPosted on December 31, 2011 Categories Starting new lifeTags Alberta, Bed and Breakfast, Guadalajara, leamington ontario, Mexico, Nuevo Vallarta, peace hills insurance, Puerto Vallarta2 Comments on The Journey to Casa Madera – Just where the heck did 2011 go? August 9, 2011 – It has been some time since I sat down at my computer at Casa Madera Bed and Breakfast and continued on with this story. My apologies to those who were waiting for the next part but it was time for my annual sojourn home to Edmonton so I could get my yearly dose of cold. Now it wasn’t that I could not have written it there but my editor was here. Yes, someone actually edits this diatribe. Heather, stand up and take a bow because without you these rantings would never be fit to be read by anybody, let alone friends. However, now she is in Canada so you are going to just have to take it as it is! But I digress, aside from being cold and swatting entire squadrons of mosquito’s, I had a great time at home. I enjoyed my visit with family and friends but I especially loved spending time with Elizabeth, my granddaughter and my children (OK grown adults), Allison and Brendan. You always have to bring things back that people like. Brendan always gets hot sauce, the hotter the better but this year we found pickled habaneros so if he is making you a sandwich, watch out. The major item that was brought back this year was 8 bottles of Tajin (pronounced -taheen) which is a spicy salt that you sprinkle on fruits and vegetables. Heather’s sister’s family and friends have come to want it by the case so I stuffed as many as I could in my suitcase. I firmly believe that is the reason I got searched by US Customs going into Denver! But as usual the star in the suitcase was the bottle of Tequila for my brother. 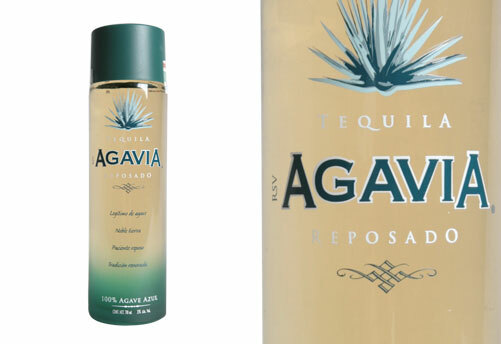 You cannot buy good Tequila in Canada without dropping a lot of dough and for the most part you just cannot buy GOOD tequila in Canada at all. So I bring him a bottle back every year as there are times when you want to sit back, relax and sip a good tequila. Tequila. The name is enough to make a lot of people shiver. Mainly because they had bad experiences with it when they were younger. Something which I can attest to myself. Whoever introduced the idea of a tequila punch party should be shot….but I digress. I truly began to appreciate Tequila when I came down to Puerto Vallarta to buy the condo into which we moved. I stopped in a bar one night on that trip and sat at the bar to watch a ball game. The bartender and I got talking and he walked me through the various tequila’s he had and explained the differences in quality and taste. He was the one who showed me that Tequila should be sipped, not shot. He was right. After moving through about 4 different variety’s you could taste the difference between grades. It was a good night and it allowed me to appreciate the subtlties located within that glass. 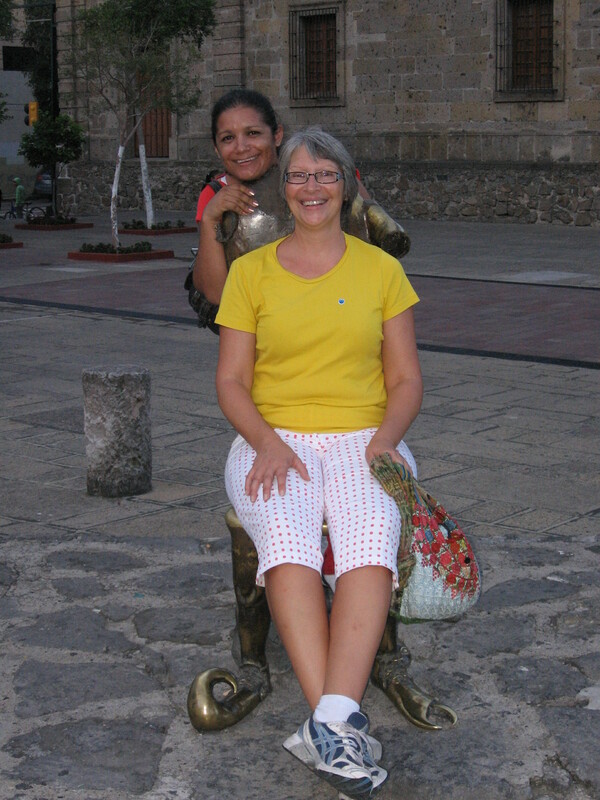 Thinking about good tequila always sends me back to our Guadalajara trip with Mary and Lore as it was them that suggested that one afternoon we should head out to the town Tequila, Jalisco. It had already been a full trip. Lots of sightseeing and shopping we were having a great time. Mary and Lore though thought we should take a small trip outside of town to Tequila. It sounded pretty good to us but Mary had to convince her brothers that they should take us. They had to finish dealing with the Papaya that they had but they were game so at 3:00 they loaded us all into the box of their Nissan King cab and we were off. Yes, the box. There was not enough room for us all in the cab so 4 of us got to ride in the box. Considering it was about 32 degrees the box was a nice change. 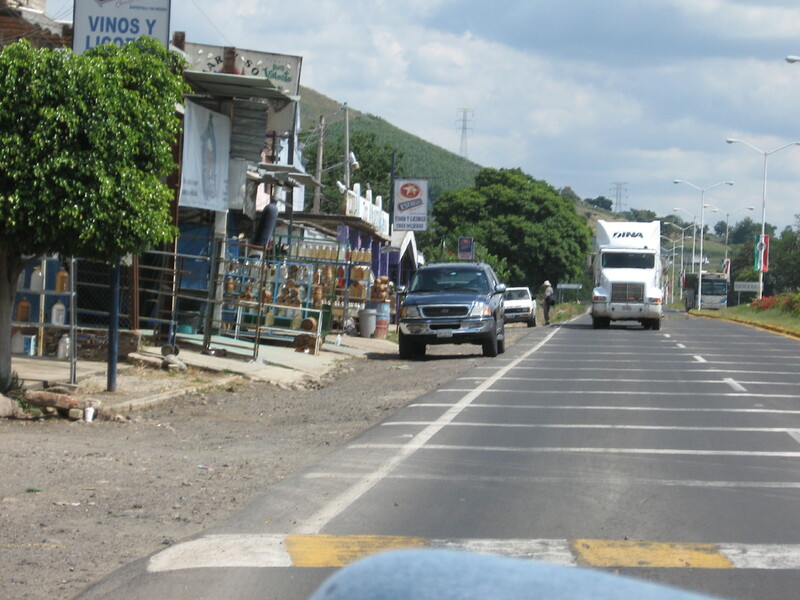 However, the road to Tequila is not straight and it is very busy. Traffic moves at the speed of light so you have to hold on. It was fun but I am not sure I would want to do it again. We arrived in Tequila in about 30 minutes. 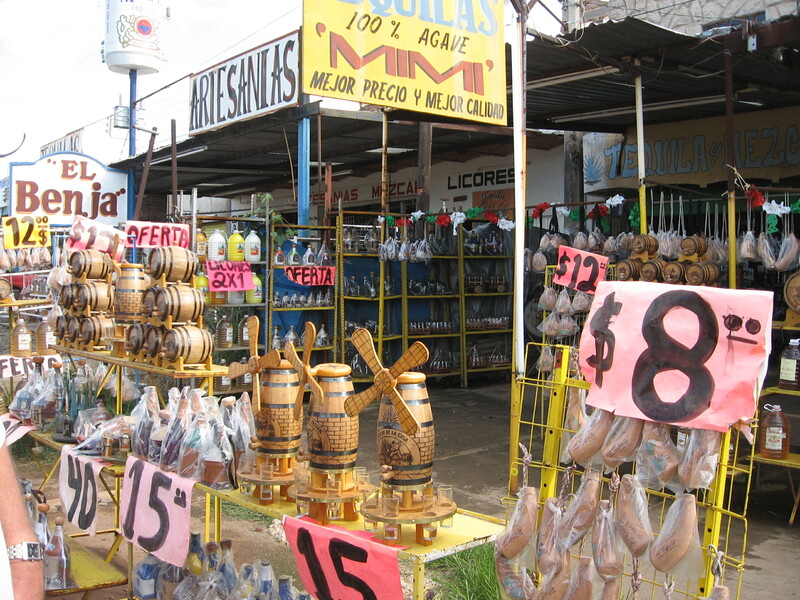 It is a quaint little town with stores everywhere dedicated to selling…tequila! The stores are everywhere. Selling anywhere from 1 to 5 liter bottles. Now the interesting thing in Tequila is that tequila is not taxed. Not one of the bottles had a tax sticker in any of the stores we were in, including the brand name stores. This allows you to get some good Tequila for a reasonable price. We were moving from store to store tasting this one, that one and that one over there. It was great but there were more things to see in Tequila besides the stores. 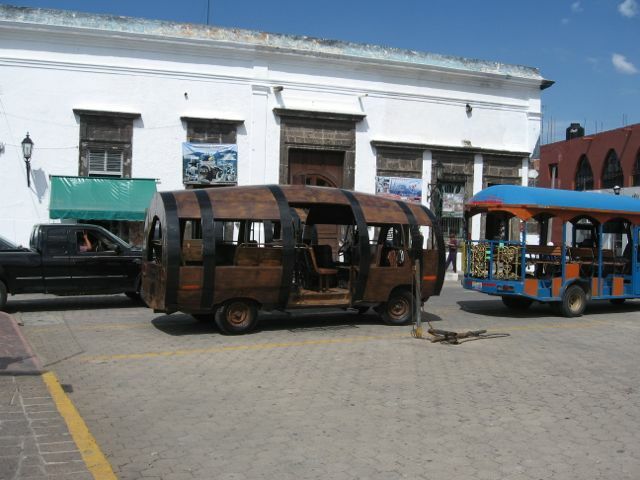 If one had the time you could tour the Jose Cuervo Distillery or one of the many others in town. We did not have time to take a tour so we did our own small walking tour of the town. Checking out the square, one of the town cathedrals and seeing what else there is to do. We will return to Tequila when we actually have time to stay there for a day or two to see all the sights. If you ever have the time to see this town I would highly recommend it. It is a great place. The time had come however to buy a bottle so I called in the brothers to tell me which one I should buy. After trying a few they pointed at one and said it was the purest. So I said the person behind the counter how much was the 5 liter bottle? 150 pesos! 14 bucks! You’re kidding, right? Nope, he wasn’t. I quickly paid the man and took my leave in case he changed his mind. Tequila bought we hopped back into the truck and made our way back to Guadalajara. It was great visit in a neat town. Author Kevin WoodPosted on August 9, 2011 Categories Starting new lifeTags Bottle, Brendan, Canada, Casa Madera Bed & Breakfast, Edmonton, Guadalajara, Guadalajara Jalisco, José Cuervo, TequilaLeave a comment on Good things come from dirty laundry, part 4 – did someone say TEQUILA! 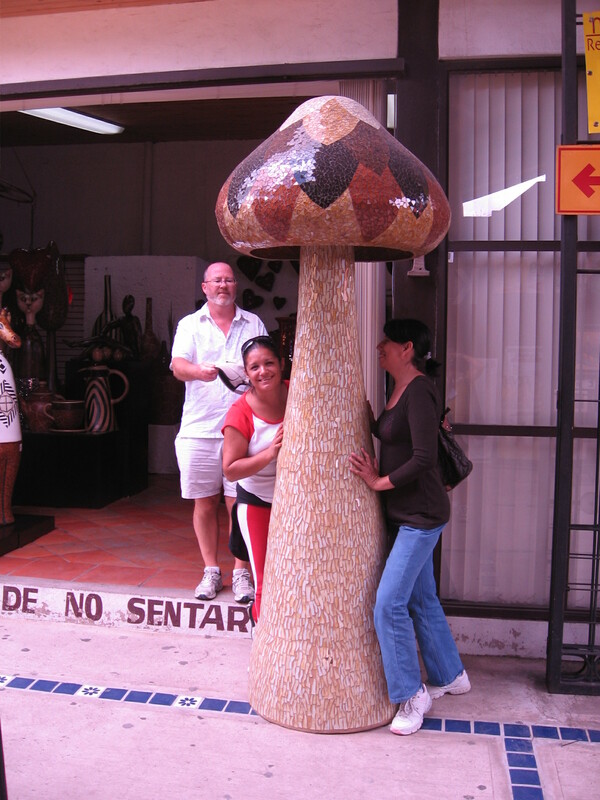 September 2009 – We had heard many things about the City of Tonala and were very interested to see what it was all about. Tonala is a suburb of Guadalajara which is similar to many of the other great city’s in the world with a small central core and many other separate cities or boroughs attached making up its mammoth size. We had been looking forward to this trip for quite a while…. After a delicious breakfast of fresh papaya the four of us, Mary, Lore, Heather and I headed to the city bus stop a few blocks away. The bus was crowded and it was every person for themselves when it came to getting a seat. This lead to us getting separated on the bus but from what I could see is we were in for a long ride so sooner or later seats would open up closer together. Well that was a great thought. Never happened, people would get off but another load would get on so any extra seats never came available. Oh well, we were adults so I was pretty sure we would figure it out. It was a typical bus ride. Quick, lots of stops and lots of things to look at. It was an entertaining ride. As we crested a hill there was a lot of movement on the bus, people were making their way towards the doors. A lot of people. It was then that I heard a cry that would become familiar over the next few days, KEVIN!, in accented spanish was called by Mary and I am pretty sure it could have been heard 6 buses away but it got my attention. Apparently it was time to get off. As the bus pulled away all we could see stretching for blocks was blue tarps. This was it. The Tonala street market. Every Thursday and Sunday people came and sold their wares along about countless city blocks on this road. But that was not all, it went down alleyways and other cross streets. It was literally amazing. Enough looking, let’s get across the street and see what they have! They had everything. Heather and I were in awe. Pottery, glassware, leather, flowers, artwork, household items, religious items, lights, clothing, furniture, pets, herbs, candy and of course, food. Our plan was to wander through today and if we saw something we liked Mary and Lore would find out what the cost was as in most cases it was thought that if Heather or I asked, it would be more. So we wandered, we stopped, we looked, we bought. 2 sets of 2 round paper lamps for 10 bucks. 6 coffee mugs and a stand 5 bucks. The same mugs in Puerto Vallarta were 5 bucks each! As we found out through out the day, everything was much cheaper there than here but there was a good reason. Tonala was the factory town. Everything was made there and shipped out. We loaded ourselves up and about 3:00 we thought we should head for home. As we had a great deal of stuff Mary called her brother and asked him to come and pick us up. We packed as much as we could into the trunk of their Nissan Tsuru but we still had stuff on our laps. Apparently we bought more than we thought but we got it home. After a nice visit with Mary’s family Mary and Lore decided they should take us downtown so back to the bus we went. 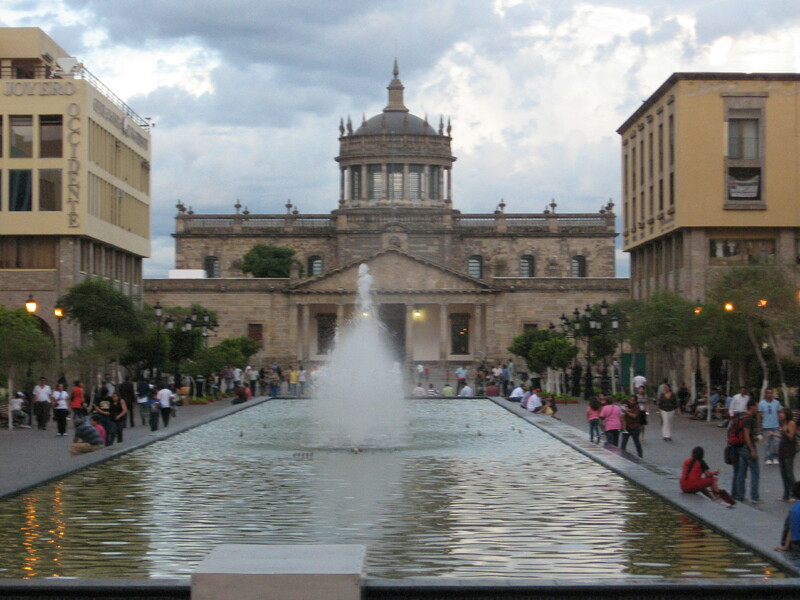 Downtown Guadalajara is something to behold. What a beautiful city. They lead us to all the highlights. The place was bustling. The Cathedral, the government buildings, the central market which is absolutely huge. It was spectacular. We were walking down a pedestrian walkway in jewellery section of town when we came across a building that was originally an orphanage many years ago. Lore wanted us to see inside as apparently it is special. We wandered around the square while she went in search of someone she knew to see if she could arrange a tour. The building it turned out was closed that night for a special function but if we come back tomorrow at 10:oo am he will give us a tour. We agreed to that and wandered around a bit more before Mary said we needed to see this one cathedral so off we went to find that one. It was about 6 or 7 blocks away but it was a beautiful night so we wandered towards this cathedral. When we arrived it was really busy. Wedding central. One wedding was going on inside and another wedding party was waiting out in front of the doors. It was something else. The square in front of it was hopping too. Vendors selling all kinds of things and people just out enjoying the night in a pretty place. It was then that what they wanted us to see happened. It was 9:00 pm and the church bells chimed. That was not all there was though, this church had a glockenspiel which started to work as the bells started to toll. All the Mexican Catholic Saints started to come out of the doors and go down their track. It was really cool and something we are really glad we saw. Heather and Mary on some of the coolest sculptures ever. They could be in the hot sun all day and never get hot! Mary and Lore were not done yet though. As the one wedding was emptying out and the other was still getting itself in order they hustled us into the church to see it. It was beautiful. The woodwork in it was amazing as were most things. It was a sight to behold. After that I could not imagine that the orphanage could be anymore beautiful but as usual I was wrong…. June 22, 2011 – I am sitting on our balcony at Casa Madera watching the rain drop from the sky. It is intense for our first real rain of the season. Rain. Never thought I would enjoy it as much as I do here. It probably has something to do with the fact that it is still 26 degrees and the water falling is warm not cold like it is in Canada. When it comes like this it is nice. However yesterday we were on a hurricane watch as Hurricane Beatriz was working her way up the Mexican coast and while it would most likely not hit us directly we would probably get tropical storm winds and lots and lots of rain. Beatriz though was just like the latest Canadian political landscape, it took a straight left turn and wandered out into the ocean. Hurricanes. Never had to worry about hurricanes in Edmonton however if you want warm weather you take the little side extras that comes with it. Our first experience with a hurricane like event was in September 2009 and it came from the most unlikely source…..
September 2009 – We had made the deal on the house that was to become Casa Madera and were patiently waiting for it to close. There were many delays but we were told don’t worry it will close, we just don’t know when. We had told Mary and Lore about the house purchase prior to returning to Canada for a vacation at the end of July. They were very excited for us. They were well aware of what we had in the condo and it was not going to go far in a 3000 square foot house. It was then that they suggested we should all go to Guadalajara to shop for items for the house. This was a great idea. Heather and I always wanted to go to Guadalajara but had not been able to fit it in yet. So we agreed that when returned from Canada we would set it up for the end of September after my kids had returned home (they were coming back with us for a vacation). We returned and the dates were set. We would leave Thursday morning on the midnight bus so we could hit the market in Tonala which runs Thursdays and Sundays. We would stay at Mary’s parents house. Ok, this will be interesting but really who better to haul you around a city of 8,000,000 people than a couple of people who lived there! To do this though we would have to get over our fear of being on the highway at night. The one main rule we had always been told was to never, ever drive at night. The roads are narrow, twisty and there is always the possibility of running into a cow as they sometimes graze on the side of the highways. However, it made the most sense to do this so we said ok.
On the day we were to leave Mary said she would come by the condo and pick us up around 8:00 pm. From our condo we went over to her friends Carlos and Bertha’s house Bertha was determined to feed us and feed us she did. Tacos dorado (deep-fried with potatoes, yummy), beans, rice, guacamole, it was endless and very, very good. After she filled us with food we were off to the bus depot where we purchased tickets to Guadalajara which included a snack on board. In minutes we were on the bus and on our way. A big adventure for Heather and I who really did not know what to expect. Mary and Lore were in total control. The bus ride was non eventful. There was a movie if you wanted to watch but I was more interested in trying to sleep. Sleep, now that would have been nice. I don’t sleep well in moving vehicles, never have but I did manage to catch an hour of shut-eye on the 4 hour trip. We rolled into Guadalajara at 4:00 am and took a cab to Mary’s parents house. It was 4:45 am and we were greeted by Mary’s mother who had the biggest grin on her face for someone who was awakened at this ungodly hour to let her daughter, her daughter’s best friend and two middle-aged deer in the headlights white people into her house. After the introductions we were shown to our bedroom and laid down to try to get a little sleep before the big shopping day. We were up at 7:30 and went downstairs to actually say hello. Or try. We spoke very little spanish at this point and they spoke no english so we did what we could. While we were talking I noticed in the corner of the living room there was a mountain made of Papaya’s. No one offered any explanation for them being there and we did not ask as we were just trying to fit in. At that point Mary’s mother, her sister Maggie, and Maggie’s son were up. Then two of the largest men I had ever seen walked into the living room. Mary’s brothers, Fernando and Victor. Identical twins, great. I will have enough problems getting know everybody’s name without dealing with identical twins! Victor and Fernando started loading the papaya‘s into the back of their pick up. Once loaded they were off and as far as we could tell were selling them door to door for 10 pesos each. Then more people came out of the back of the house. Where were they all coming from? This house is huge. It turned out that 3 families were living in the house though we found out later that one was moving out on the weekend to their own apartment. Heather and I were suffering from severe culture shock. We were definitely fish out of water and were really never sure what was going to happen next. Breakfast, that’s what happened next. Papaya, now there was a surprise. I was never a big fan of papaya but this was really good and we enjoyed it thoroughly. Full of papaya we picked up our stuff and headed out to catch the bus to Tonala.